Ottawa has been good to us too. 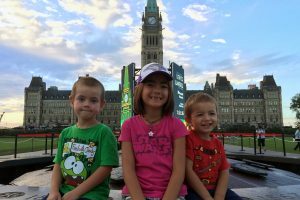 We enjoyed the city for the afternoon, and we also got to enjoy the second last Northern Lights show on Parliament Hill. 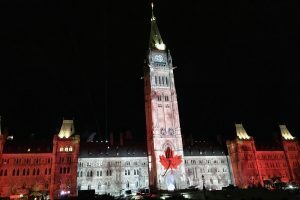 The end of the Northern Lights show at Parliament Hill. I may or may not have welled up with tears of Canadian Pride. 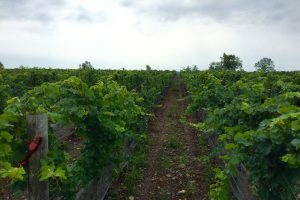 Before we got to Ottawa, we stayed in Trenton and visited Sandbanks and the Norman Hardie winery. 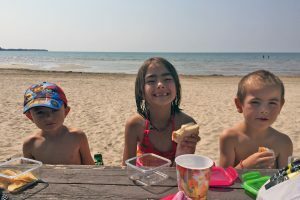 Our day at Sandbanks was pretty perfect-we frolicked in the water all day, messing around like a group of monkeys. I hope our kids remember that day. Our perfect lunch on our perfect day at Sandbanks. We went to Norman Hardie to visit a friend, Marty, who works there. It was a treat to get to see him in action, being a boss and getting things done. He spoiled us like crazy and made us feel so loved. The grapevines at Norman Hardie. So far, the journey hasn’t felt like we’re on our own. We’ve been visiting places and people we’re familiar with, not really wandering on our own yet. Once we leave Ontario, it will be us on the road, with total reliance on God… Places that aren’t that familiar, a language that isn’t that familiar and tough road conditions we haven’t had to navigate through yet, literally and relationally. It seems as if we’ve lost sight of what this journey was supposed to be for us. The delays and the familiarity of people and places have dulled the goal a bit. I find myself struggling to ask God for help, guidance and wisdom. When we decided that this journey was what God was encouraging us towards, we wanted to glorify him with every aspect of this life. We wanted to open ourselves up to his encompassing leadership, to walk alongside God in this unique garden He’s given to us, to align our hearts with His and never doubt about wether or not what we’re think we’re hearing is from God. We’re just a few short days into the physical journeying, we’ve hit a few speed bumps, and I’ve failed at meeting our goal. I’ve quarrelled, I’ve relied on myself, I’ve neglected to tell God that I need him. Thankfully, I know that my God forgives. I know He is just waiting for me to realize that I can’t do this on my own so that He can pick me up, hold me in His hands, console me and encourage me towards meeting with Him every chance I can.